If you’re like me and you occasionally feel stuck creatively, you might be searching for ways to get those juices pumping again. Well, my fellow writing friend, you’ve found some great tips that you can do today. 1. Infuse Your Diffuser—Are you in on the latest essential oil craze? I’m not here to sell you essential oils, but I can tell you that smells matter. Research has shown that smells stimulate your brain quicker because of the olfactory senses being so close to your brain. That’s why a smell can bring back a memory quicker than anything. Hmmm, I wonder if there’s been research with people who have Alzheimer’s? Anyway, I digress. My point here is if you use a particular smell in the area where you write and use it consistently, it will trigger your brain to know this is our creative time and if you choose the smells that are associated with more alertness and stimulation, you’ll get a two-for-one deal. I like peppermint and cinnamon. Maybe I’m a foodie at heart. I’m still experimenting with my diffuser but you could use a room freshener. There are some really pretty plug-in’s I’ve seen lately. If you used scents to help you write, please let me know what scent is your favorite. I’d love to hear about it and give it a try myself. 2. Less is More—Have you heard this? Well, I know it’s a great motto for living and leaving less of a carbon footprint and I’m on board with that, but for creativity, less is not more. You see, when we have nothing around us, no colors, no chachkies with sentimental value, no stuff—well, our brains just aren’t as creative. Our brains need, no crave, stimulation. If you’re in a boring bland empty colorless room, you’re going to get what you put it, nothing. You’ll be staring at a blank page quicker than a tick latches onto a hound dog. Now, I’m no friend of clutter. I grew up with an OCD (that’s obsessive compulsive disorder, for those non-psychology majors) mother who wanted everything in its’ place. I mean there was no clutter anywhere, not even our bedrooms, no closets stuffed with stuff, nothing hidden under our beds. I’ll stop before you start feeling sorry for me. She didn’t really have a disorder, she just didn’t like clutter so you can see why I don’t either. However, my writing office, it’s become, ahem, sorry Mom, cluttered. I have all kinds of article clippings (yes, I still do that) and stuffed shoved on shelves and actually spilling out onto the floor and bags hanging from hooks that are also stuffed with stuff and drawers filled to the brim. Oh, and I have a problem with collecting pillows. I can’t seem to find just the right one, so I’ve bought quite a few. The guest bed in my writing office has become the holding pen for all the pillows I have rejected. It’s a great place to take a break from writing (which I never do because I’m a writing machine. LOL). But, I also have beautiful French doors that open onto my large porch and overlook our lush tropical backyard and pond brimming with life. This is a place of great inspiration for me; my writing “stuff,” my collection of pillows and the beautiful great outdoors. So, surround yourself with what you love—make it colorful, fun, whimsical is even better, and filled with whatever inspires you. Please share with me what things you like to have around you when you’re writing, I’d love to hear it. 3. Computer typing or pen-holding writing?—I know we love our computers. I do too. I’m so productive. I can type really fast because I grew up in an age where we were taught typing. So, I don’t have to look at the keyboard and I don’t even think of letters, I think in whole words and my fingers know where to go. I, however, cannot type with my thumbs. We’ll leave that up to the younger generation. Wouldn’t it be funny if we grew extra thumbs to help us type more? Okay, okay, I know--a total digression. However, when you type, there is research that shows, you do not use your most creative part of your brain. There are two sides to your brain—a right side and a wrong side, I mean left side. Your right side is the creative side and the left is your more rational side. When you type, you are using the left side of your brain. To stimulate the right side of your brain, the creative side, you need to use your hands. Research has shown that when you write, the act of transferring your thoughts to your hands and onto the paper actually stimulates the right side of your brain thus causing you to be more creative. If you haven’t actually hand written something in a while, I dare you to try it. You might just remember why you fell in love with writing in the first place. Please share with me your experience, I’d love to hear how this goes for you. Wanda Luthman has her Masters of Arts in both Mental Health Counseling and Guidance Counseling from Rollins College located in beautiful Winter Park, Florida. She has worked at the local Community Mental Health Center, the local Community College, Hospice, and is currently a Guidance Counselor. Her calling in life is to help others be their best selves. She writes magical, whimsical, adventure books that delight and inspire children. She has always loved reading and writing and wrote many books and poems as a child growing up in Missouri. She presently resides in Brevard County Florida with her husband of 22 years and 2 dogs. 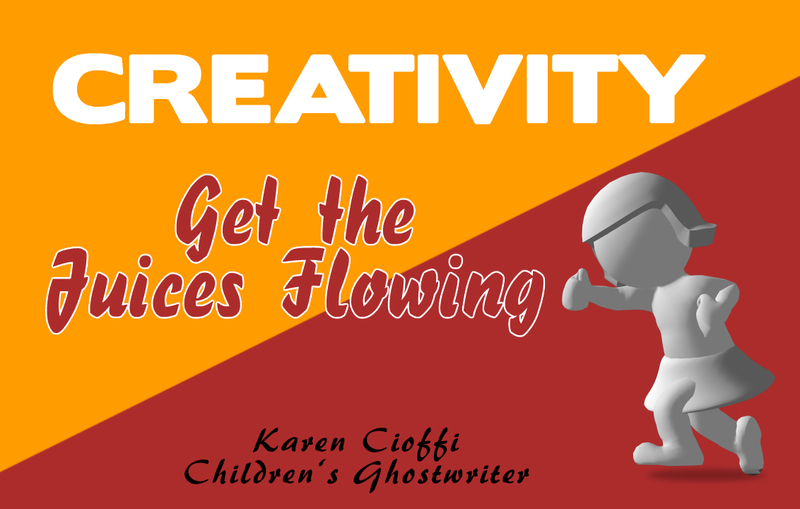 Wanda, great tips for getting the creative juices flowing. I have to practice #3 more. I rarely write with pen, but I know it's important. Thanks for sharing! I love that diffuser suggestion, Wanda! 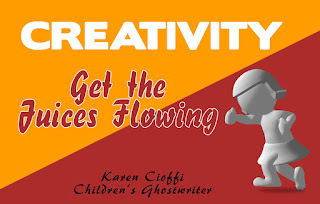 We all know how it is to use all the senses in our writing and then forget to apply the concept to creativity! Thank you, Carolyn! I love my diffuser! Lavender is my favorite but that's more for relaxation. The part about hand writing - using a pen - is something that really helps me be more creative. In fact, when I'm working on the details of a new story, I usually sit down with pen and paper and hand write them. Now I know I need to use my diffuser, too. :) Thanks for the tips!